Following consumer demand, Brown-Forman has released Woodford Reserve Double Double Oaked 2019 Edition in limited quantities. Woodford Reserve Double Double Oaked was first launched in 2015 and is released annually in January. According to the brand, the Bourbon “gained a cult-like following and became a requested expression from consumers across the world”. The bottling is part of the brand’s annual Distillery Series, which celebrates master distiller Chris Morris’ “commitment to innovation and craftsmanship”. “People love this product for its unique style and rich flavour profile and we listened to their calls to bring it back for multiple encore appearances,” said Morris. 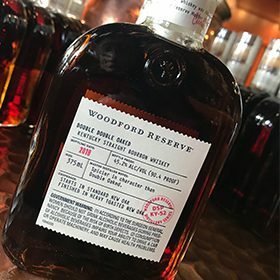 The limited edition bottling is the result of finishing Woodford Reserve Bourbon for two years in a second barrel that was heavily toasted and lightly charred. This is in contrast to Double Oaked, which is only aged for a year in the second barrel. As a result of the extra year of ageing, the new Bourbon is “distinctively spicier” than Double Oaked. Double Double Oaked is described as having an aroma of “rich maple syrup, dark butterscotch, brittle caramel, bittersweet chocolate burnt marshmallow and sweet hickory smoke”. While the palate is noted as “rich, dried cherry and cranberry fruit swim in a blackberry jam brightened with hints of ripe apple”. The finish is “warm and drying with a lingering clove character”. Bottled at 90.4 proof, Woodford Reserve Double Double Oaked has an RRP of US$49.99 for a 375ml bottle. It is available to buy only at the Woodford Reserve Distillery in Kentucky. The Distillery Series also includes a barrel-finished rye, a blended rye and the Five Malt expression. Woodford Reserve Double Oaked was named our American Whiskey Taste Master 2018 in The Spirits Business‘s Global Spirits Masters series of blind-tasting competitions.